In a society where we take over the counter medications to obtain relief from virtually every ailment imaginable, it makes sense to consider the effects of everyday medications on your tummy. While many medications have the potential to cause an upset tummy, the main ones of concern are pain relievers. In particular, they are the most commonly taken medications and some Britons are taking these on a regular basis. Whether you suffer from arthritis, a headache or fever, or one of the numerous other conditions that prompt you to take a pain reliever, you should take caution when it comes to your tummy. Overall, there are approximately twenty NSAIDs and they include drugs such as aspirin and ibuprofen. These drugs can be linked to gastritis and also heartburn and ulcers. While many people take these drugs and have no problems, those who may be taking pain relievers daily, are elderly or already suffer from a condition of the gastrointestinal tract may want to be particularly cautious about their use of these everyday medications. There are fortunately ways to minimise the risks. For most people, you shouldn't be using NSAIDs long-term unless under the advice of your physician. For pain relief, more than ten days of use should be a sign to see your doctor if you haven't already done so. Generally, use for this span of time won't tend to pose significant side effects or problems with your tummy. It's typically best to take your medications with food and water. A full glass of water and just a small snack can make an enormous difference in how your tummy responds to the medication. Some people find that an antacid is helpful as well. If you drink alcohol and smoke, you're further increasing your risks of tummy upset from medications. Either stopping completely or at least avoiding the substances when you take your medication can be helpful for your tummy. Some people also find that when they take their medication makes a difference in how their tummy feels. Sometimes, it is simply a case of taking your pain reliever in the morning with breakfast rather than in the evening. For those who take other medications, especially prescription ones, these could be reacting with your pain reliever to upset your tummy. It's a good idea to speak to your doctor or pharmacist about any other medications you're taking if you find your tummy is upset from your pain relievers. In particular, if you're taking a blood thinner along with aspirin, you can have a higher chance of stomach upset as well as a greater risk of bleeding. It's similarly important to be aware of the signs of a stomach ulcer if you are taking pain relievers, especially if long-term and under the guidance of your doctor. If you have pain in your abdomen along with dark and bloody stools, you should seek medical attention right away, as it could be an ulcer. 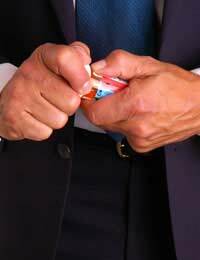 Most of us will need a pain reliever at some point in time but others may require chronic use. To avoid tummy problems, speak to your doctor and pharmacist about how best to protect your tummy and get the most benefit from your everyday medications.